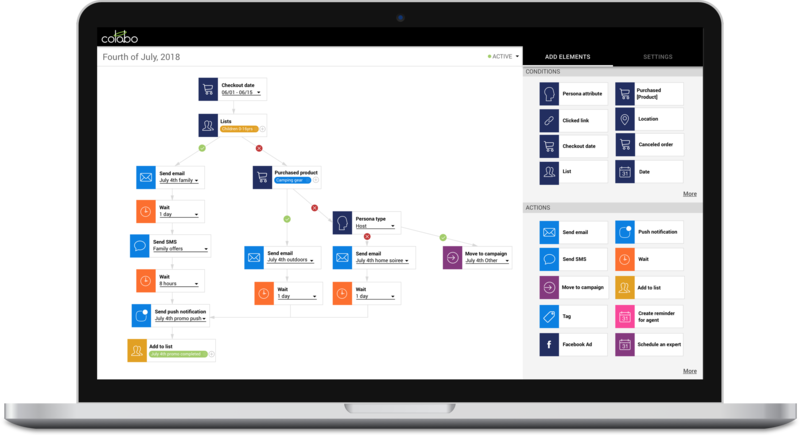 Colabo’s Customer Journey Orchestrator allows retailers, for the first time, to embrace multiple digital and in-store channels without losing the ability to analyze and guide the customer’s journey along the experience the brand delivers. How do leading brands guide their customers' journey to increase revenue? Asda, a UK retailer, is known for using local, social and user-generated campaigns to drive customers to local stores and fulfill immediate product demand. It recently leveraged the cultural interest in unicorns to drive customers to their local stores. Asda promoted giant unicorn plush toys on Facebook, featuring real customers who purchased them at local stores, using call-to-action puns such as “flying off the shelves” to increase the hype. The online posts listed relevant local stores locations, which only increased the unicorn frenzy and the customers’ sense of urgency for getting it. Foot traffic and in-store sales grew across all locations. Colabo’s CJO allows enterprises to plan and execute guided omnichannel customer journeys. Initiate unique journeys that utilize all touch points and increase customer engagement, by building sophisticated workflows that leverage digital channel’s that translate into personalized in-store experiences. In the above example workflow, an electronic goods retailer wanted to increase sales of smart-home networking solutions. The campaign targets customers which purchased smart home products and reached out with connectivity issues, and aims to up-sell them on advanced home wi-fi products. Online purchase of product, with a free same-day delivery. After the purchase is completed, an automatic task is added to an external delivery company. In addition, a follow up call is scheduled with customer support to assure proper installation of the solution. In-store expert consultation - scheduling a store visit to the expert. As part of the special offer, the customer is offered a pick-up to the store, which is done by sending an automated request directly to Uber. When the customer approaches the store, the expert is notified and meets the customer to help him with the wi-fi mesh purchase. Colabo syncs with all your systems, including Data management, CRMs & marketing tools, fulfilment flows, and much more - and translates it into conditions and actions that are available on the orchestrator dashboard. Choose the condition to trigger your promotional campaign. Segment by conditions such as personal attributes, internal classification and customer history and profile, i.e - age, location, previous purchases. Set the promotional actions for each segment to create a personalized and targeted campaign. - i.e emails, SMS, Facebook ads etc. That’s it! The campaign can go live immediately - without waiting for complex coding, and it operates automatically, without troubling your team of humans. The Workflows amount is unlimited - create as many as you’d like to orchestrate different journeys. Above is an additional example of a Journey orchestrator workflow for a holiday promotion. The campaign targets active customers, so the first condition is a recent checkout activity. Segmentations are done by population lists, purchase history, and attributes (internal classification for ‘personas’). The customers in each segment are delivered with targeted content via emails, SMS messages and push notifications. The sample above a promotional workflow, but orchestrator actions are not limited to marketing attempts. The orchestrate offers guiding possibilities and actions such as scheduling in-store or house visits, purchase and fulfillment possibilities, queue for follow ups, and much more. Everything related to the customer’s journey and experiences is managed form a single interface.